Get to know the 'Venice of the North' on a private full-day tour of St Petersburg, complete with skip-the-line Hermitage entry. Start with a sightseeing overview of the city, stopping at such landmarks as Peter and Paul Fortress―the birthplace of St Petersburg―St Isaac's Cathedral, Palace Square and the onion-domed Church on the Spilled Blood. 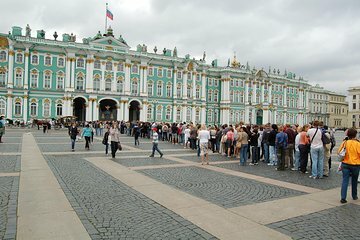 Enjoy lunch at a traditional Russian restaurant (optional), then set out for a visit to the Hermitage Museum―home to the planet's largest collections of paintings, including works by iconic artists like Monet, Rembrandt and van Gogh.